Did you know that sellers posting ads about their products in your classifieds are allowed to get direct payments through PayPal for the goods they’re offering? Thanks to this, customers and sellers can complete the transaction on your site, which makes your site a kind of a selling platform. As an admin, you have to activate the option. In Admin Panel go to Settings -> Payment -> PayPal. In the last field Buy Now Button set Enabled. Email submitted by the user while registration has to be the Paypal email address connected with the sellers account. If you want users to be able to use a different email for their PayPal account, follow this guide. A seller, while posting an ad, has to set the price in the ‘Price’ field. If Stock Amount is enabled, the stock amount of the product has to be greater that zero! Note it is only possible if the ‘Price’ field is active - to choose which fields are visible in the ‘Publish new advertisement’ form, go in Panel to Settings > Advertisement. Make sure there is ON selected next to the Price field. 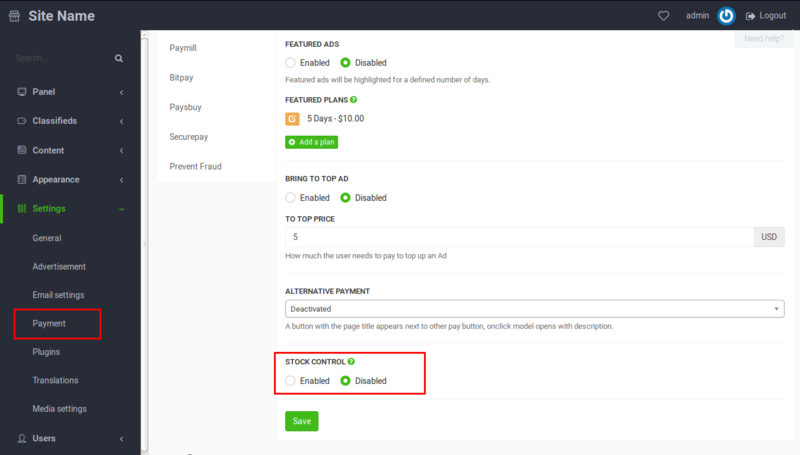 If all condition are met, an option will appear next to the published advertisement to pay for a product immediately. Payment can be done through Paypal account or with a credit card. Go to Settings > Payment > General. Set Stock Control to ON. Once you do this, your users will have the option to set a counter on their products. This counter goes down on each Paypal payment they receive. And once the counter is “O” their ad will be deactivated.